When it opened in 1925, the Androy sported a jewelry store, barber shop (with an electric face steamer), and ballroom; its Fountain Grill included a soda fountain, coffee shop, and full dining room. The hotel’s offices and 140 guest rooms each included a telephone. 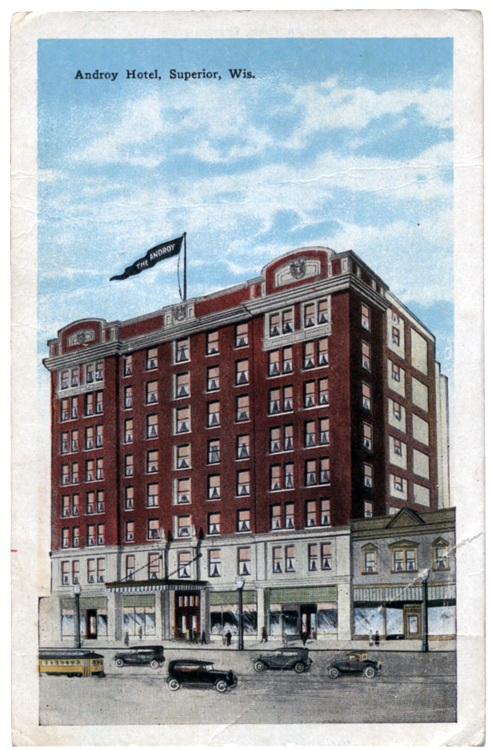 For safety’s sake, the hotel had a fire alarm system (a gong on each floor) and a city fire alarm box at the clerk’s desk; the fire escape was enclosed. In 1926, as a scheme to raise money for the local VFW’s drum corps, Billie “The Human Fly” O’Brine escaped from a straight jacket while suspended upside down atop the hotel. After that he climbed the hotel’s nine stories and shinnied up its flag pole. He pulled in $203 from the crowd and took home half.